The Tipsy Baker: Who are you and what have you done with Jennifer? Nigella would call this "temple food." Had I carefully read and considered the recipe for the dish pictured above I would never have made it. I would have thought: vegan, steamed vegetables, grains, “clean,” no one will like it. The recipe for this bowl comes from Bowl by Lukas Volger. Given my recent enthusiasm for bowls, the book caught my eye when I was at the library. The dish is simple: mixed grains topped by steamed vegetables, quick-pickled radishes, toasted walnuts, and a sauce that consists primarily of leaves. Sounds dreadful, at least to me, but that sauce is improbably magical. Four ounces watercress, 1/2 cup leafy herbs (basil, cilantro, parsley), 1/3 cup olive oil, 1 clove garlic, the green part of a few scallions, and a pinch of salt go into a food processor or blender. Puree until satiny. I used arugula as I couldn’t find any watercress and added a little extra olive to make the sauce smoother. You could serve this powerhouse sauce on plain steamed vegetables and be very happy, but if you aren’t on a low-carb diet, I would go for the full-carb package. I’d never made mixed grains before, but I will be making them again: 2/3 cup medium grain white rice, 2/3 cup millet, 2/3 cup quinoa. Rinse, put in a pot with 3 1/2 cups water and a big pinch salt, bring to a boil, cover, lower heat to bare minimum, and cook for another 15 to 20 minutes. It’s fluffier than quinoa or millet and has more protein and character than white rice. This is an early version of the recipe that appears on Volger’s blog. It’s a bit different from what you’ll find in the book, but not in any important way. 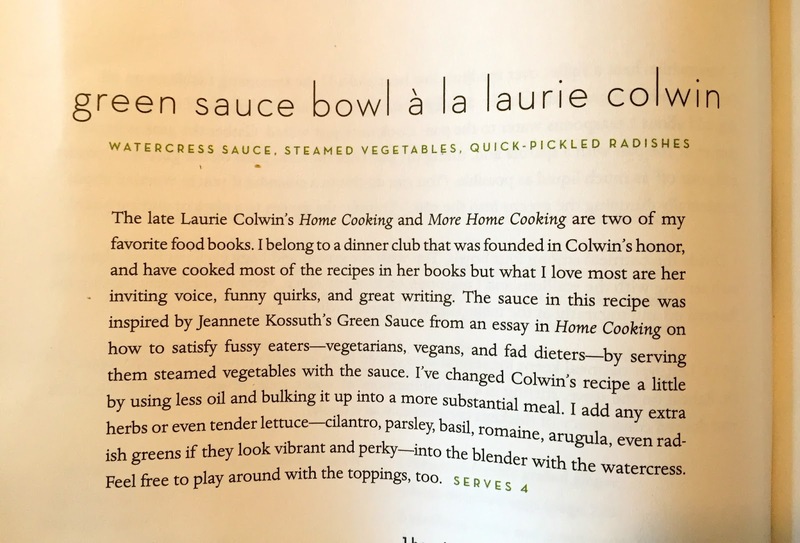 (The sauce recipe I gave above reflects the changes in the book.) 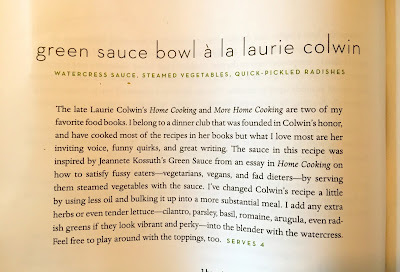 For topping I went with steamed broccoli, steamed yellow squash, and steamed sliced sweet potato, along with some quick-pickled radishes Volger provides a recipe for. I loved the sliced sweet potato, liked the broccoli, was indifferent to the squash and the radishes. Avocado would work well as would some zestier pickle. Good stuff. In response to the title of this post, I would ask, who are you and what have you done with Mark??! Really, he loved this? I cannot imagine it. I love steamed veggies, but I can't imagine me liking this much. It looks exceedingly bland, but now I guess I am going to have to try that green sauce and see what on earth you are talking about. You always intrigue me, Jennifer, and that's a great thing. That was my question too! It's like some kind of Freaky Friday swap took place between Mark and the vegan working at the desk next to him (I'm envisioning a Burning Man, homemade composting toilet type). Love this post so much - thanks, Jennifer! I have to agree with your assessment of steamed squash. Yuck. In my opinion the only use for zucchini is in fritters, as a delivery system for cheese, sour cream, and homemade applesauce. But I"m going to have to try that sauce! 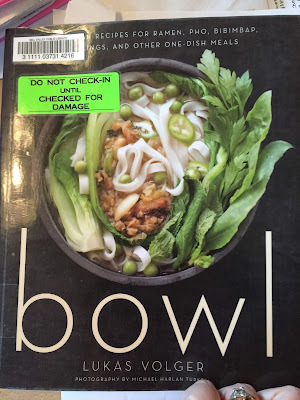 So the MV Library puts stickers on the cookbooks you check out?! Hilarious. I am going to get into bowls now. You have convinced me. I am usually a Stir Fry gal. Will let you know. Green sauce sounds good...mixed grains...check-check! I liked your notes about the mixed grains. While staying at a Hilton in Sea-Tac, I ordered the Ancient Grains Rissoto. It is made with steel-cut oats, quinoa, sorghum, millet, and (new for me) Job's Tears. It was delicious. I found Job's Tears at the Asian market, and now I have embarked on a quest to replicate the recipe. Jennifer, I made the tomato pie, and I loved it. My husband, not so much. He likes everything in it, but he doesn't like things mixed up in unfamiliar ways. When will I learn? He is not a culinary adventurist! I ate it for dinner last night, but I really think this would shine as a brunch dish. I plan to eat it with eggs as lunch today. Thanks for the recipe! Bowls are also used for drinking, as in the case of caffè latte.